That’s right, last years all inclusive holiday was so traumatic that I’m off on a cruise with my family in less than 3 weeks and I.CANNOT.WAIT. Cue 5 panic stricken ASOS orders and a trip to Boots for what will be my summer holiday essentials! Here’s what I just can’t bare to leave behind..
Getting the toiletries right for a holiday is like creating a capsule wardrobe that you know you can rely on. Holiday toiletries for me are all about making you feel good and enhancing your favourite features. I always feel and look my best on holiday when I have a healthy glow. A L’Occitane body scrub* is an absolute starting point and MUST have for me. It’s delicately scented and is so easy to use in the shower, it leaves my skin feeling smooth and soft after using it. In fact I’ll be using the scrub meticulously up until I go away so my skin has the perfect foundations for building a non patchy or flaky tan. A good moisturiser or after sun go hand in hand with a body scrub to help lock the moisture in and I’ll always be reaching for the Boots Soltan aftersun as it has such a nostalgic summer scent. If I end up particularly burnt though, Aloe Vera is an absolute god send. Hot weather has a habit of making my skin go through ‘its gotta get worse before it gets better phase’, it’s just part of life. Because of this, I’ll be packing my total fave Glamglow YOUTHMUD™ Tinglexfoliate Treatment that you’ll have read me raving about on this blog countless times. The Aesop control gel is perfect for drying spots out and minimising the redness too. Can’t be without them. 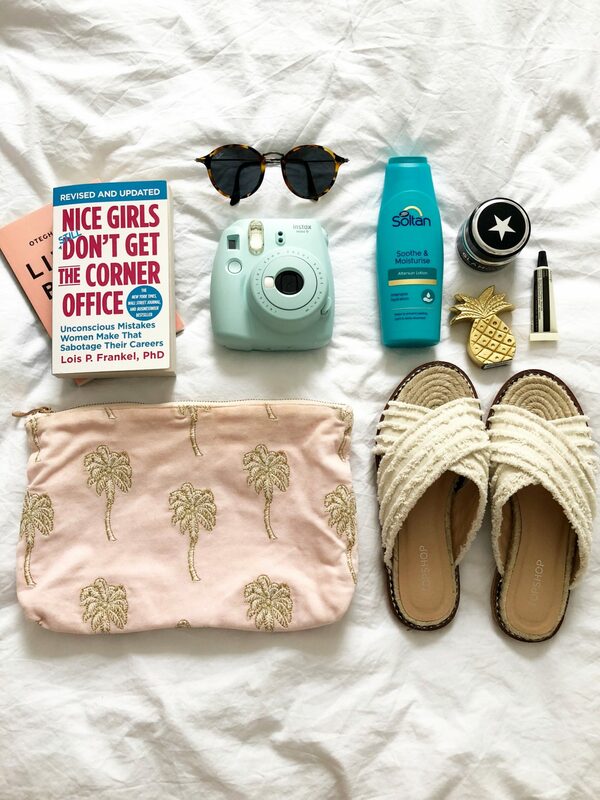 The other absolute essentials are of course a high factor SPF, SPF lip balm and ALL the makeup. Oh, and minis, because why spend £3 less for a full size bottle when they ain’t as cute, huh? Reading and totally escaping from daily life is one of my favourite bits about a holiday. Whilst I do read books at home when I find the time, a holiday promises no distractions from Love Island and constantly refreshing my Instagram feed. I get through books at the rate of knots when I’m away so I’ll probably be packing at least 3-4 new books, yippee! Guys, I’m actually thinking of having a dedicated ‘equipment’ bag for holiday because the Instagram goals has got so out of hand. Second that, I’m just gonna need a photographer for the whole trip. But yeah, I’ll be trying to get as much content as I can when I’m away, including my little Instax mini camera which is more about capturing those moments in print that I can keep forever. I’ll also be taking my Vlogging camera and obviously my phone for most of my Instagram photos. Santorini calls. The best bit about holidays? Not the packing, but buying a whole NEW wardrobe. Whilst I’ll probably only end up wearing these type of clothes on holidays where it doesn’t rain 7 days straight, 4 weeks in a row, I always invest in statement accessories that will see me through a few years. My favourite purchase this year has been my round Raybans, I lost my last pair of sunglasses down a portaloo hole in Paris and I knew it was time to upgrade. I’m excited that these will actually protect my eyes from the sun this year and look cute in all my snaps. 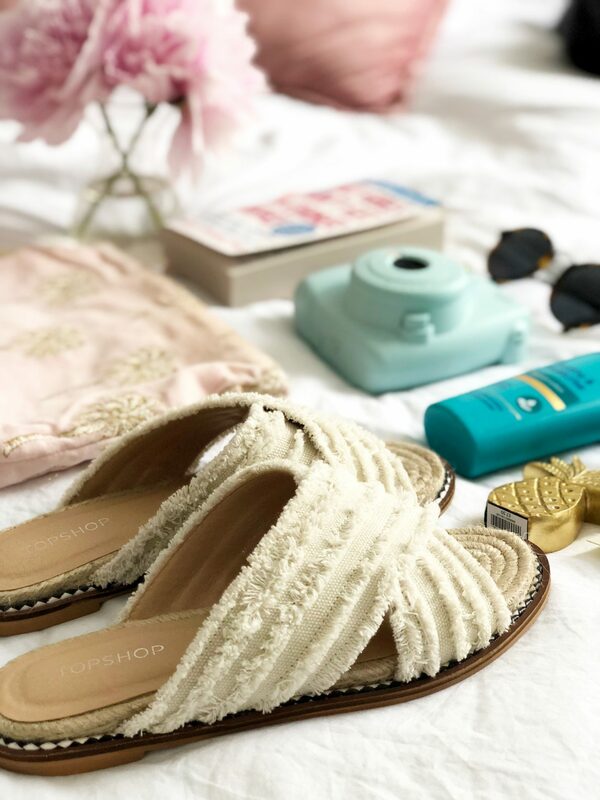 As well as shades, I’ve invested in the cutest little slides from Topshop that I just know won’t leave my feet this summer, SO comfortable. Team them with a cute little pineapple clutch or basket bag and I’m pretty much set for everyday of my holiday whatever else I’m wearing. You can’t beat core staples that undeniably become essentials in your life. It obviously goes without saying that the elasticated shorts and slouchy tops are an essential too right? There’s no such thing as too much gelato on holiday, and don’t let anyone tell you different. Are you going on holiday this summer? What are your top 3 holiday essentials you can’t live without? *This is a sponsored post, but as always, all opinions are 100% my own.